Some inventions and gadgets make our lives easier and some simply are awesome to have and we really want them for obvious reasons. We’re allowed to spend some cash on a silly item every once in a while so take a look at our list of 10 awesome inventions we want. Even though you probably wouldn’t use these inventions more than a couple of times, they’re still pretty awesome. All your friends would be jealous if they were to see these items inside your house. So without further ado, here is our list of 10 awesome inventions we want. This invention is extremely handy for storing all your shampoo bottles and accessories you use in the bath tub. Also, it will save you a lot of space as you won’t have to install extra shelves for all your products. It’s true that you can’t really buy this inside a store and you must build it yourself but this stairs step storage is extremely useful. You can make your own storage space by heading down to the DIY store and buying some tools and a drawer to build this. You can store your slippers or shoes, as well as umbrellas or anything else you might think about. Even though we hate hospitals, there is a plus in spending time there: using tables that let you eat while sitting in bed. This is a great concept and we see no point in not bringing it to your home. These tables are very well designed and you can also disguise them quite well inside the drawers next to your bed when you have visitors over so they won’t think that you’re a lazy person. It doesn’t matter how old you are, having a slide inside your home is extremely cool. If someone knocks on your front door and you’re caught up in something, simply slide down just in time before that person leaves. While it does take up a lot of space, this slide is awesome and I honestly don’t believe that there is a person who wouldn’t want this inside their home. This showerhead is pretty amazing. You could now rely on your sight rather than touching the water to find out its temperature. While touching the water isn’t exactly an inconvenience, this showerhead is still pretty cool and will save you from stepping into the shower only to find out that the water is ice cold. Manually cleaning a brush is really annoying but those days are now gone. You can simply pull a layer from the brush and clean off all of the hair from it, without having to pluck the hair out with your fingers. This is a simple yet brilliant gadget and we can’t help but wonder why we didn’t think about this first. The person that invented this probably used the plant pot as a BBQ for a long time and just decided to combine the two once and for all. We really like this idea. It’s effective, simple and elegant, and, to be completely honest, it’s a brilliant idea. This is another amazing invention. 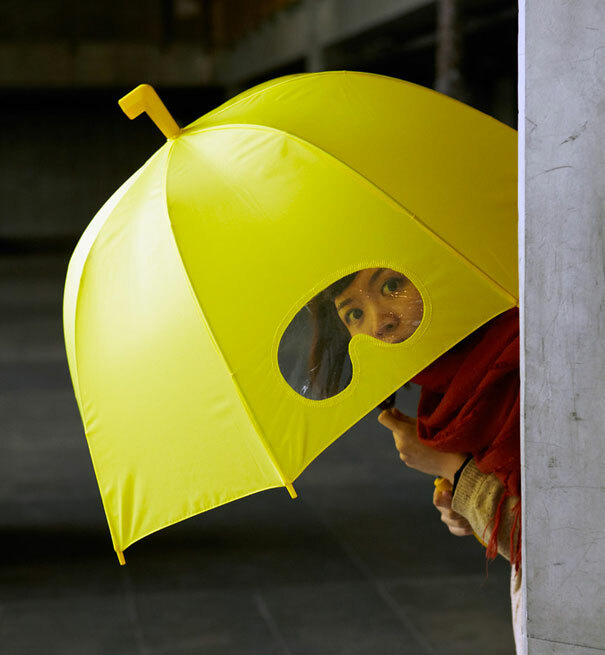 It works a lot better than a regular umbrella to keep you dry and doesn’t get in the way of your sight. Simply look through the small window to make sure you won’t bump into anyone. It’s one of our favorite gadgets on this list and we really think this was a great idea. This is an amazing thing. 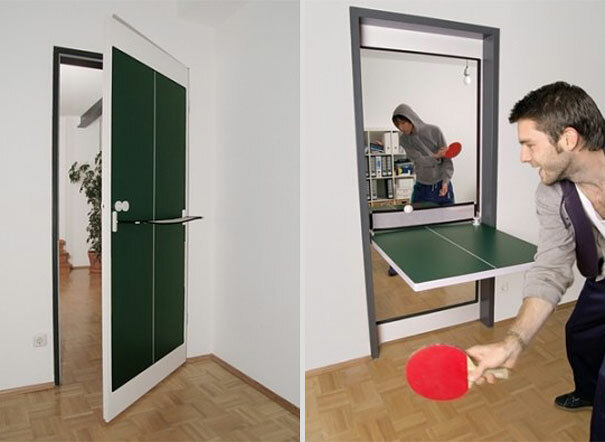 It works just as a regular door but you can also have fun with it when you have friends over. While it’s more suited for a bachelor pad, I don’t think the missus would mind having this door so much. Except maybe if she’s a sore loser and you keep beating her at ping pong (which we don’t recommend). 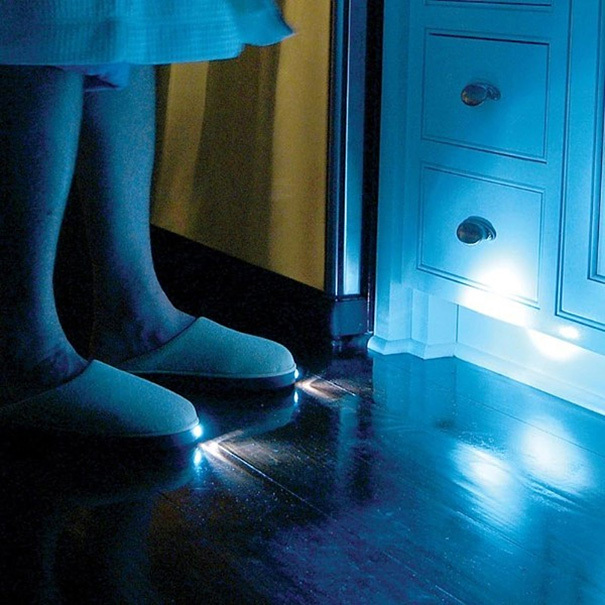 These are great for when you go for a snack in the middle of the night or when you need to go to the bathroom and don’t want to be blinded by turning on the regular lights. It’s a very simple idea and we’re glad someone thought of it. I wonder if it will help us stop bumping our toes on every piece of furniture we encounter. We think that if you do some research you will find items similar to the ones above, if not the exact same items. It’s true that you probably won’t be able to find them at your local Wal-Mart and some of them do require a little work from your part but I really think they’re worth it. So there you have it. This was our list of 10 awesome inventions we want.